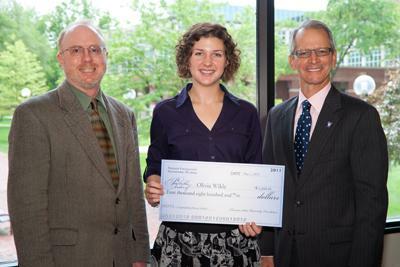 Olivia Wikle, a music major from Columbia, Mo., has been named a Presser Scholar for the 2012-2013 academic year. The “Presser Undergraduate Scholar Award” is given to an outstanding music major at the end of his or her junior year. The Presser Foundation honored Wikle with this prestigious award this spring. Wikle is currently pursuing a Bachelor of Arts degree in music, with minors in anthropology and folklore. She is the daughter of Chris and Carolyn Wikle of Columbia, Mo., and is a graduate of Hickman High School. Randall Smith, left, professor of music, and University President Troy D. Paino. At Truman, Wikle studies saxophone with Randall Smith, professor of music. She performs as a tenor saxophonist with Truman’s Wind Symphony I and Saxophone Quartet. In Fall 2011, the Saxophone Quartet won second place at the Music Teachers National Association Collegiate Chamber Music Competition. In addition to performing, she is a member of the women’s professional music fraternity, Sigma Alpha Iota; a freshman theory mentor; and a teaching assistant for Basic Keyboard Skills I and II. In Summer 2011, she was the recipient of one of Truman’s Grants in Aid of Scholarship and Research. The product of that research, a presentation and paper entitled “The Singing Never Stopped: The Transformation of Scottish and American Supernatural Balladry,” was presented by Wikle at the 2012 National Conference on Undergraduate Research at Weber State University in Ogden, Utah. 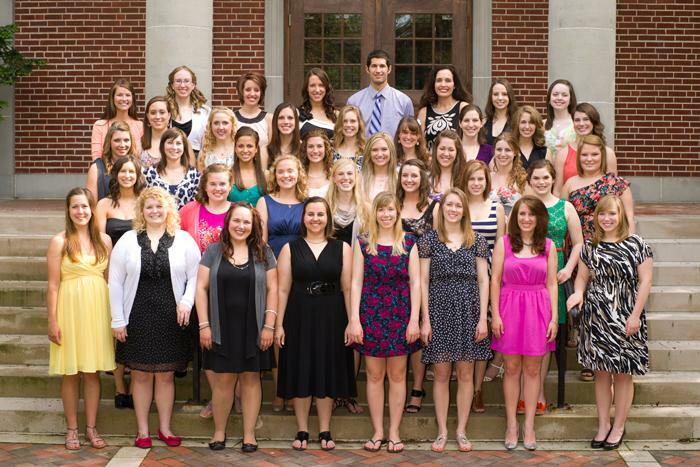 During the spring semester, Wikle was also inducted into Phi Beta Kappa. Wikle plans to continue her formal studies in music by pursuing a graduate degree in musicology beginning in Fall 2013. A Schuyler County school teacher and a Truman Master of Arts in Education student will each receive help for their classrooms after being selected to receive this year’s Dr. Kay Clapp Children’s Literacy Fund Award. Dr. Kay Clapp, middle, with Sara Perrachione, left, and Christina Garrett, right, recipients of this year’s Dr. Kay Clapp Children’s Literacy Fund Award. The Dr. Kay Clapp Children’s Literacy Fund was endowed through the Truman State University Foundation to honor Dr. Clapp, a professor emeritus in the Department of Education at Truman. Clapp is a powerful proponent of literacy and children’s literature. Hundreds of students and practicing teachers have been influenced by her dedication and careful mentoring. The fund provides a cash award to a Master of Arts in Education student and a local teacher to purchase children’s literature for their professional practices. This year’s recipients are Sara Perrachione, a student who is finishing a teaching internship at the Kirksville R-III School District, and Christina Garrett, a teacher at the Schuyler County R-I Elementary School in Queen City. 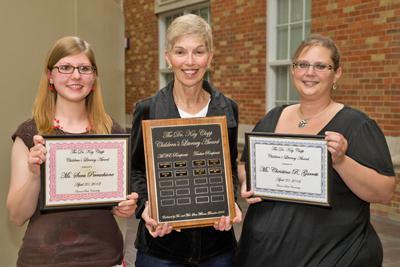 The awards were presented during a ceremony April 30 on the Truman campus. Nursing Department students in the class of 2012 received their nursing pin at a pre-commencement ceremony May 4 on campus. The pinning ceremony recognizes the graduating seniors’ successful completion of a rigorous academic and professional program. Pictured, first row, left to right: Jessica Wehner, Amelia Payne, Christine Trucke, Lindsey Mollick, Amy Wiley, Andrea Russell, Bridget Cahill and Elizabeth Reuther. Second row, left to right: Allison Foster, Elisabeth Coleman, Amanda Kliethermes, Sarah Brown, Emily Berenz, Kayla Aydelott and Sarah Schroeder. Third row, left to right: Paige McCullough, Lauren Weise, Lauren Lampe, Marilee Kanago, Whitney Henke, Tamera Guilford, Jolene Roth and Allison Harper. Fourth row, left to right: Molly Wersching, Kayla Portwood, Kathryn Moore, Sarah Jacobson, Heather Talpers, Emily VonGruben, Stephanie Grauel and Maxine Brenner. Fifth row, left to right: Sarah Marshall, Carolyn Ingersoll, Kaityln Friedly, Megan Menzel, Samuel Neudecker, Carlyn Wall, Sarah Lacy and Cassandra St. Onge. Not pictured: Elizabeth Cottey-Dole. 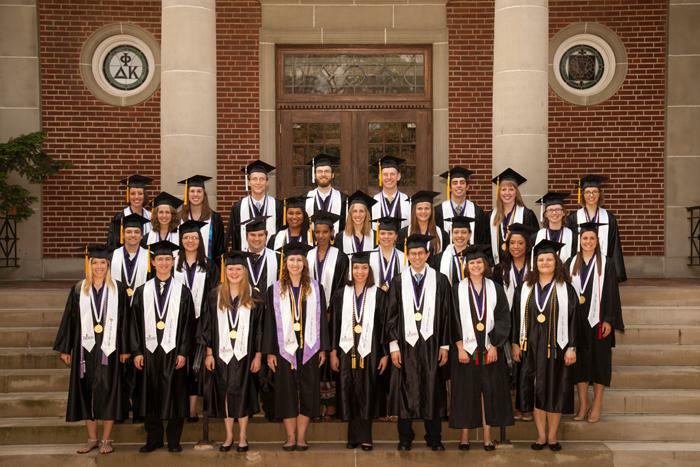 Truman recognized 30 students as valedictorians during spring commencement ceremonies May 5. Pictured, first row, left to right: Amy Wiley, Evan Mirts, Erin Sanders, Jennifer Pearlstein, Emily Autrey, Henry Dust, Terin Budine and Michelle Bak. Second row, left to right: Robert Utterback, Jessica Phillips, Ryan Mueller, Hazar Khidir, Alex Nyquist, Teagen Nabity, Audrey Nyi and Lauren Dowdy. Third row, left to right: Stephanie Grauel, Julia Davis, Amy Lehnhoff, Mickaela Gerler and Kristen Miller. Fourth row, left to right: Kaitlyn Friedly, Juliet Alderson, Adam Crews, Stephen Riesenberg, Kevin Satzinger, Brian Tillis, Kaylee Wiesemann and Kaylin Boeckman. Not pictured: Michael Dial. in the Student Union Building. 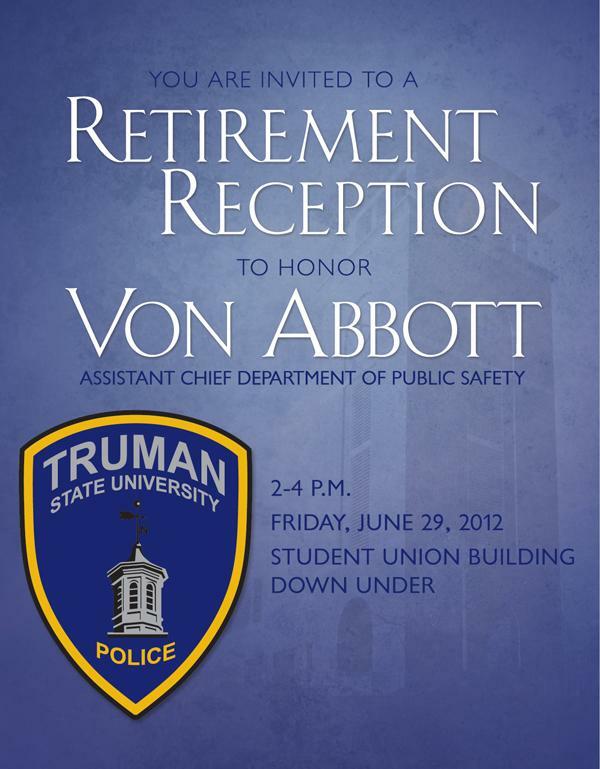 Jack Magruder’s retirement as president of ATSU. The BigSun Organization is offering a $500 scholarship. All student-athletes are eligible for this award, regardless of sport. Deadline for submission is June 22. To learn how to apply, visit bigsunathletics.com. Currently enrolled undergraduate college students are eligible to apply for the Foreclosure.com 2012 Scholarship Program. Students may go to foreclosure.com/scholarship to find out how to be entered to win one of five scholarships by writing an essay on stimulating the US housing market. Top prize is $5,000, second through fifth place will receive $1,000 each. 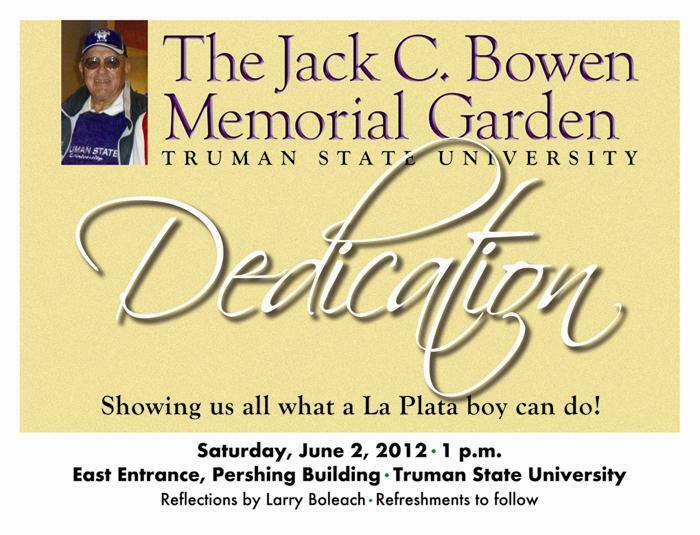 The next issue of the Truman Today will be available June 12. Xiaofen Chen, associate professor of economics, has been awarded a Japan Studies Institute (JSI) Fellowship by the American Association of State Colleges and Universities. The fellowship supports participation in the JSI at San Diego State University on Incorporating Japanese Studies into the Undergraduate Curriculum in Summer 2012. Royce Kallerud and Roger Johnson each received 2012 Still Spirit Awards April 30. Since 2005, A.T. Still University in Kirksville has recognized outstanding community members whose actions embody school founder, Dr. Andrew Taylor Still, and his leadership and spirit of volunteerism, through the Still Spirit Awards. Kallerud, professor of English, was recognized for his efforts to bring a four-mile walking trail from downtown Kirksville to Thousand Hills State Park. Johnson, custodian in Ophelia Parrish, was recognized for his volunteerism, charity fundraising for many causes, including the Adair County Public Library, and for the creation of the hall of fame display for Truman athletics. Betty L. McLane-Iles, professor of French and member of the City of Kirksville Historical Preservation Commission, participated in the 2012 Missouri Certified Local Government Forum in Jefferson City April 21. McLane-Iles, along with Brad Selby, commission administrator and codes inspector, and Kenneth Shook, commission chair architect, represented Kirksville and the KHPC at this statewide annual event. Recently, five members of Truman’s IT Services Department presented workshops at MORENet’s Bi-Annual Conference, HELIX, in Kansas City, Mo. The theme for the spring conference was “Learning Without Limits.” Potential presenters submitted proposals, and three of Truman’s IT Staff proposals were accepted. Diane Richmond, director of Learning Technologies, and Susan Thomas, instructional designer, presented a program entitled “Limitless Options: Preparing Established On-Ground Instructors to be Effective in the Online Environment,” showcasing Truman’s self-designed “Ready, Set, Click!” program for instructors wishing to teach online. Amy Nunan and Julie Hanes, both technical support specialists at Truman, presented the program, “Limitless Classroom Innovation,” highlighting Truman’s tiered technology classroom system and how both the teaching/learning environment and support options can be improved through thoughtful standardization. Thomas and Nathan Gillette, technical support specialist, presented their program entitled “Limitless Performances: Choosing and Implementing an Easy/Low-Cost Live Streaming Solution,” showcasing Truman’s ability to live stream music performances from Ophelia Parrish’s Performance Hall. Truman is the first Missouri public university to live stream concerts around the globe. Marilyn Romine, business academic advisor, received the Outstanding Woman Leader Award for 2011-12 from the Missouri Women of Today. She received the statewide award May 5 in Moberly, Mo. Romine was nominated by the Kirksville Women of Today after winning the local community Outstanding Woman Leader competition. Taste of Truman will take place June 15-17. The Taste of Truman is an opportunity for lifelong learners to attend short lectures by some of Truman’s greatest professors. For more information about the program or how to register, contact the Truman Institute at 785.5406 or jmorton@truman.edu.